I laughed when I read the daily prompt. Seriously I did. Anyone that knows me well will know I am NOT a Fashionista. Not even close. I could care less about clothes. When I was younger and out in the work force, I may have paid a little more attention to clothes, but probably not. I have never been much interested in clothes and style and fashion. Give me a pair of jeans and a comfortable blouse and I’m good. Don’t even get me started on shoes! If I could go barefoot all year I would. I hate shoes. I hate shoe shopping. I hate clothes shopping. Don’t get me wrong. I’m always clean and neat in appearance, just was never into dressing to impress. Which reminds me. I don’t even own a dress or skirt! Or heels. Ugh, heels. Torturous devices. Granted they make a woman’s legs look great, but I don’t care for them. 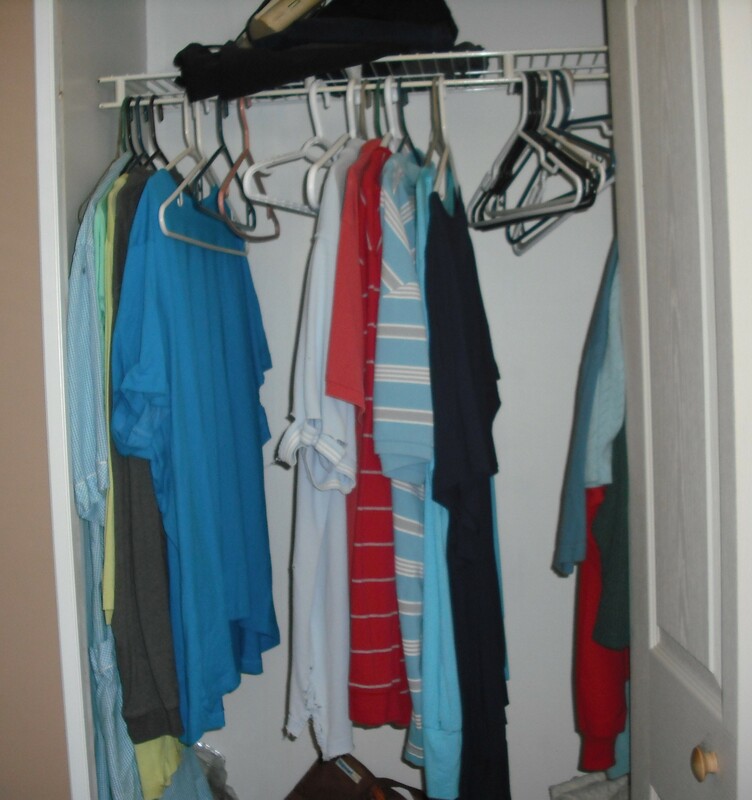 I have two closets in my bedroom. They are not even big closets. But there are two of them. Only one of them has clothes hanging in them. One! That one isn’t even full! So obviously clothes are not that important to me. Now ask me how many shelves are devoted to books. Ha! Yeah, I have a lot more books than I do clothes. I like it that way. If push came to shove I can always tape some book pages over my body and call it good. hahaha! Whoa, now that puts a picture in your mind you didn’t want. Terrible injustice to books. My closet speaks for itself. As for appearance impacting how I feel about myself. It has nothing to do with clothes. It shouldn’t have anything to do with clothes. They are just a covering, a drop cloth, an accessory to what and who you are. What impacts how I feel about myself is, how I feel about myself. Do I feel better about myself as a whole? Do I feel healthy, happy, in charge of my life? Am I feeling fulfilled as a person? Not how do I look in this piece of clothing, or how my hair looks today, or do I wear makeup or lipstick. None of these things impact how I feel about myself. Anymore. See how I qualified that? Anymore. When I was young, I was like most young people. How I looked, how I dressed was more important. Now that I’m older and have been through all the things that I have in my life, I’ve found it doesn’t matter how I dress. I could have myself wrapped in toilet paper and it wouldn’t make any difference about what I think of myself. Well okay, I might feel silly. But what a good laugh I would have! You get what I’m saying though. You’re smart people. Clothes are just fabric, thread, buttons or zippers. They are not YOU. They are not ME. Thanks for the link! Good insight on the daily prompt I agree that clothes don’t make you who you are! Sometimes people forget that. I knew a college professor with his PhD, made loads of money very sweet, sucessful guy. He dressed as a professor is expected but, boy, if you saw him outside of school you would have thought he was homeless! Never judge a book by its cover or people by the clothes on their back ;). Very interesting subject for me. I 100% agree with you. I may expound on that at some point. My closet has slightly more than yours but I also do not stuff one closet. Life changes equal wardrobe changes. I too prefer to spend money on books. I wasn’t one into fashion when I was working either. As a teenager I was. Then I had a transformation in my later years and became obsessed with shoes and cloths. Then got sick and gained weight and just want to look neat and clean. I never did much care for clothes. Used to drive my mom nuts. 🙂 Thanks for stopping by!